The Louisiana Superdome, sometimes referred to as the New Orleans Superdome, is an exhibition facility located in New Orleans Louisiana. The architectural plans were drawn in 1967 by Curtis and Davis, an architectural firm. Construction broke ground in 1971, and was completed in 1975. The Louisiana Superdome is the biggest fixed dome facility in the world. The New Orleans Superdome is two hundred and ten meters in diameter and eighty three meters tall. The area of the structure totals fifty three thousand square meters (thirteen acres). The facility is one of a small number of structures capable of hosting the Super Bowl and NCAA final four events. The Louisiana Superdome Is also home to the New Orleans Saints and the Tulane University Football Team. 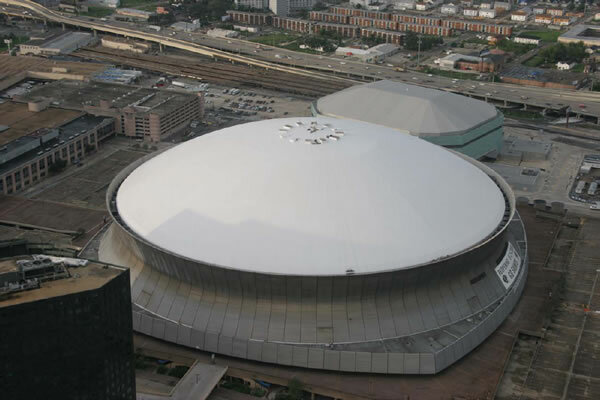 The New Orleans Superdome is an example of a well known structure with a foam roof. 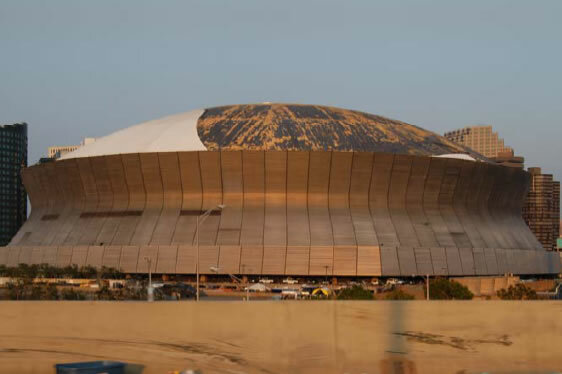 The Louisiana Superdome opened in 1975, and was constructed with a polyurethane foam roof. The best foam coating at the time was very brittle, and in the Late 1970’s a massive hail storm (with golf ball sized hail) caused small dents in the foam which resulted in small narrow circles of exposed foam (1mm wide). The damaged roof did not leak. Over the next 12 years, the venue management company responsible for the superdome (SMG) spent $750,000 on research to deal with the small circles of exposed foam and finally decided to recoat the foam at a cost of $250,000 USD. The roof continued to waterproof and insulate the Superdome. Later, in 2003, thinking the foam roof was ‘old’ the polyurethane foam was torn off and replaced with what they were told was a ‘state of the art’ EPDM rubber roofing (single ply roofing). Through misinformation SMG was lead to believe that EPDM was a superior roofing material. The manufacturer guaranteed the new roof to withstand winds up to 130mph. 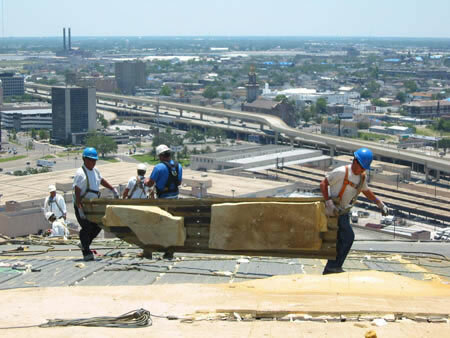 When Hurricane Katrina struck in 2005, sub 100mph winds completely blew off most of the EPDM roof membrane. The single ply EPDM membrane failed after just two years at wind speeds substantially less than promised. On August 29th 2005, Hurricane Katrina struck with devastating force, causing an estimated $81 billion dollars in damage. New Orleans Louisiana was flooded wiping out 80% of the city. 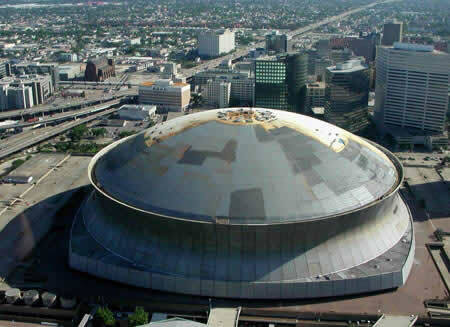 During Hurricane Katrina, extensive damage was done to the roof of the Superdome. After more research SMG decided to re-roof with sprayed polyurethane foam. While EPDM failed around 130mph in a wind tunnel, polyurethane foam did not fail at any speed. In fact, polyurethane foam withstood 200mph winds (the maximum speed the wind tunnel could provide) with flying colors. Polyurethane foam was originally chosen by NASA to self-adhere to the slick aluminum surface of the external fuel tank of the space shuttle and withstand wind shear beyond 1000mph (and it does this while keeping the liquid hydrogen at a very cool -423 degrees Fahrenheit). This foam used on the fuel tank is the very same 2.5 pound density foam used in most roofing applications. The result is a superior, self-adhering, waterproof, insulating membrane. Sprayed foam is the only insulation material that does not soak up water. The 70,000 seat dome stadium was re-roofed with polyurethane foam by Brazos Urethane Inc. The foam was supplied by Bay Systems North America, a subsidiary of Bayer Material Science LLC. Honeywell Enovate was used as the blowing agent. 3,750 roof panels were raised into place one at a time by a crane. After each panel was welded into place, the installation crew sprayed a seamless leak-resistant layer of closed-cell insulating foam into place. 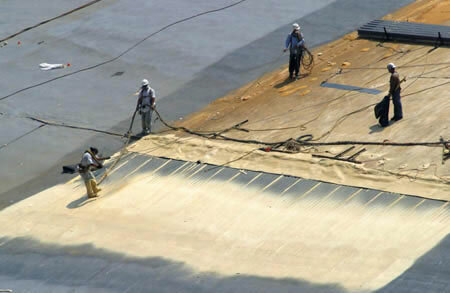 Then a layer of elastomeric coating was applied to increase durability. After all sections were secured, the roof was power-washed to remove welding slag and a final layer of coating was applied. The Superdome has 3,750 metal panels for a total of 9.7 acres in roof area. 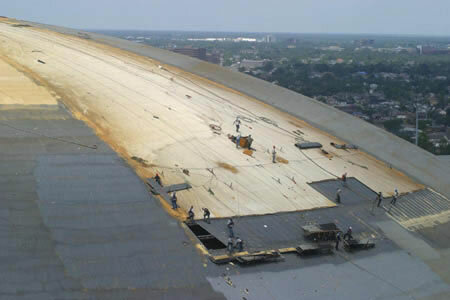 The Louisiana Superdome polyurethane foam roof under construction. 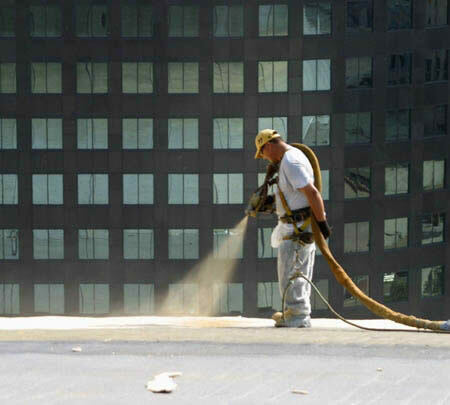 Spray foam creates a seamless monolithic barrier, both water-proofing and insulating. Workers prepare to weld in more roof panels. The crew uses highly sophisticated equipment to spray the liquids that become waterproof polyurethane foam in 3 seconds. 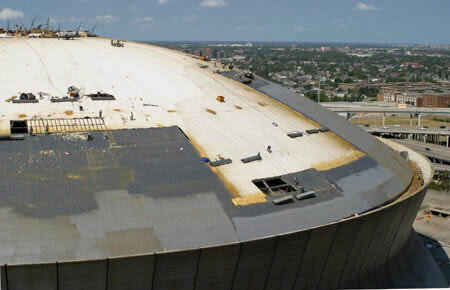 The partially complete foam roof of the Louisiana Superdome. 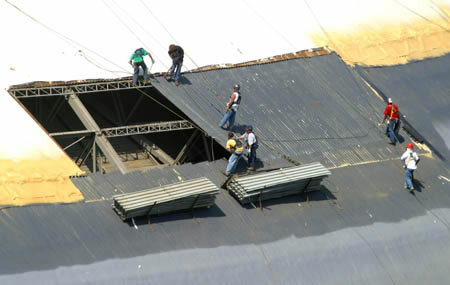 Workers moving a Superdome roof panel. 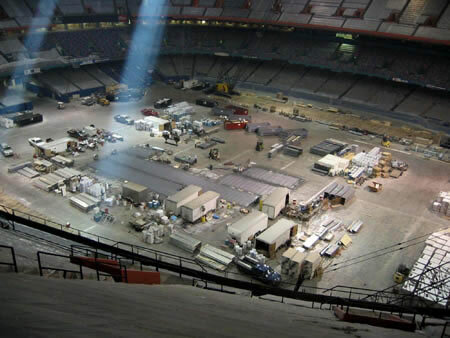 An indoor view of the New Orleans Superdome. The foam re-roofing work in progress on the New Orleans Superdome. It’s amazing that the superdome was able to become a shelter of last resort for 30,000 refugees. They really provided a great community service. I didn’t realize that only a few other venues in the entire country match the size of the superdome.